Our next big project of 2015 took place in early February. 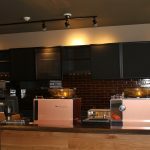 This project involved a remodel of the Starbucks located on Harvard Street in the Coolidge Corner area of Brookline, MA. For people in this neighborhood, this Starbucks is the place for a morning coffee, meeting friends, or resting after an exhausting day at work. 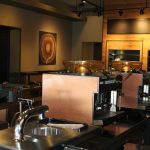 JD Contractors, LLC was trusted to transform this location into a stylish and modern place where customers could enjoy their daily cup of coffee in comfort. JDC’s remodeling team first prepared a detailed schedule of the remodel. One of the initial challenges was the store’s location. The Starbucks is located on a busy street in Brookline, which made parking and material deliveries a challenge. With only a small parking space in the back of the store, and a busy, snow-covered street, everything had to follow the pre-established schedule. JDC’s remodeling team and subcontractors spent 5 days and 2 additional nights to accomplish the remodel. This project started Sunday night with the demolition of all existing furniture and equipment. The scope of work included new plumbing fixtures, electrical wiring, framing new walls, tiling, and painting. The last part of the remodel involved installing new casework. All work that was taken care of by JD Contracting and our trusted subcontractors was performed professionally and of the highest quality. 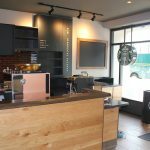 This and the fact that we scheduled and finished the remodel during night hours ensured that this busy Starbucks location could reopen after only 5 days of being closed. Additionally, all work was completed within the designated timeframe and on budget. 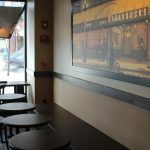 As of Saturday, February 7, Coolidge Corner customers can now enjoy their morning coffee in a completely renovated store. The location now offers more seating space, surrounded by attractive artwork, and provides the staff with an overall better work environment.